We actually celebrated a couple months ago, but it hasn't been blogged yet :o) Tet Trung Thu is a Vietnamese holiday our family started celebrating last year. 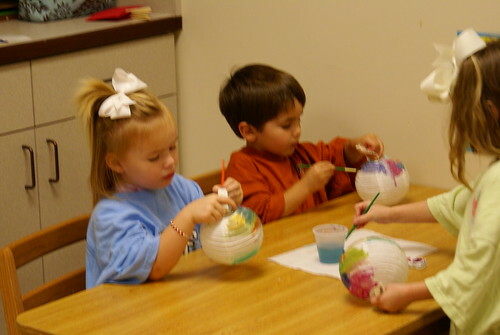 This year, we decided to have a party at Hillary Ashton's school to help her friend's learn more about Vietnam! 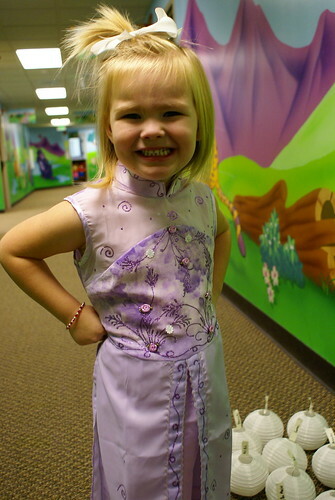 Hillary Ashton dressed up in her beautiful purple Ao Dai we got in Vietnam. 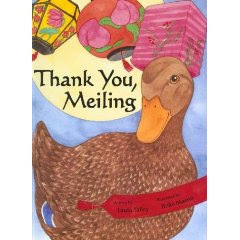 We read Thank You, Meiling to her class, painted paper lanterns and had mooncakes (actually moonpies, haha!). Before I read the story, I explained to the kids about how our family has been blessed by adoption and asked them if they knew where Sophie Le was born. I was so impressed a couple of them knew! Anyways, we sent home a cute little pair of chopsticks home with each child with a little card attached explaining a little about the holiday we celebrated. The kids had a great time and enjoyed learning a little about Vietnam.